Help! How Do I Improvise Over a Half-Diminished Chord? I was recently asked if I could I do a post on the mysterious Half-Diminished chord (check out our Half-Diminished chord workouts) so here is a basic guide to improvising over this widely misunderstood chord symbol, including some scale choices and example licks. The half-diminished, or minor 7(b5) chord, is a pretty common chord, but it’s not as common as major 7th, minor 7th, or dominant 7th chords. The Half-Diminished chord is made up of the chord tones 1, b3, b5, and b7. I think the reason that half-diminished chords seem so mysterious to some improvisers is because they are less common than major, minor, and dominant chords, and so we have fewer opportunities to practice them in context. Take heart; as you will see, improvising over a half-diminished chord isn’t all that different from improvising over a minor chord. 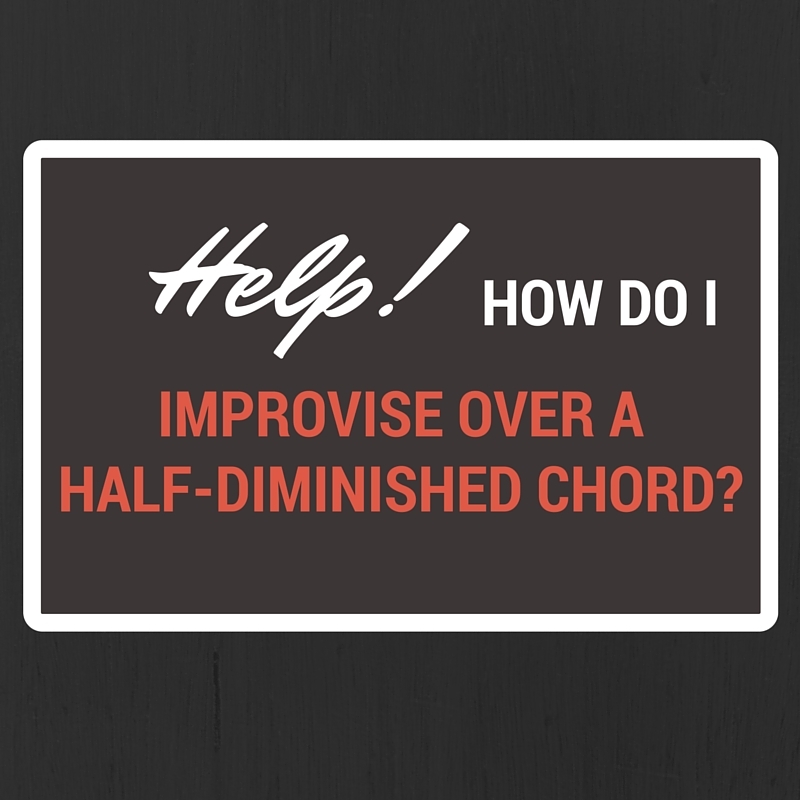 What is a Half-Diminshed Chord? A Half-Diminished chord is a Minor 7th chord with a flat 5th. The chord is spelled 1, b3, b5, b7. It is important to realize that a min7(b5) chord has three of it’s four notes in common with a minor 7th chord. The only pitch that is different between a minor 7th chord and a half-diminished chord is the 5th, which becomes a b5 for the Half-Diminished chord. The Fully-Diminished chord also differs from the Half-Diminished chord by one note: 1, b3, b5, bb7. The 7th is lowered twice for a Fully-Diminished chord, but only once for a Half-Diminished chord. While you can certainly arpeggiate the chord tones and you will sound like you are improvising in the changes, sometimes it’s nice to have more note choices available to you so your melody isn’t limited to only 4 notes! What Pitch Collections (Scales) Are Associated with a Half-Diminshed Chord? Incidentally, a Locrian scale is like a Natural Minor scale (1, 2, b3, 4, 5, b6, b7, 8), but with the addition of a b2 and a b5 instead of the natural 2 and 5! It is only one note different than a Phrygian scale (1, b2, b3, 4, 5, b6, b7, 8). The Locrian scale has a b5 instead of a natural 5. The Locrian #2 Scale is like the Locrian (1, b2, b3, 4, b5, b6, b7, 8) scale with a natural 2 instead of a b2. The Locrian #2 (1, 2, b3, 4, b5, b6, b7, 8) scale is actually the 6th mode of the Melodic Minor scale. Since one of the 2 versions of a Half-Diminished scale is derived from a Melodic Minor scale, it is worth mentioning that in jazz theory, the Melodic Minor scale (1, 2, b3, 4, 5, 6, 7, 8) is the same going up and down, as opposed to classical theory, in which the Melodic Minor scale ascends the same way as in jazz, but differs on the way down. In classical theory, the scale actually comes down as a natural minor scale. The 6th and 7th scale degrees are both lowered a half-step on the way down. The reason jazz theory doesn’t change the melodic minor scale on the way down is because the scale is supposed to be a vehicle for improvisation. If the pitch collection changes between ascending and descending scales, that’s not very helpful for improvisers. I use the term “Scale” with some hesitation. I have started to prefer the term “Pitch Collection” in place of “Scale” because of the mental picture associated with playing “scales.” The only problem with “Pitch Collection” is that people don’t always know what it means! Here are some licks that use the two different versions of a “Half-Diminished scale.” This will hopefully help some people to get some ideas on how to use these sounds. Enjoy! 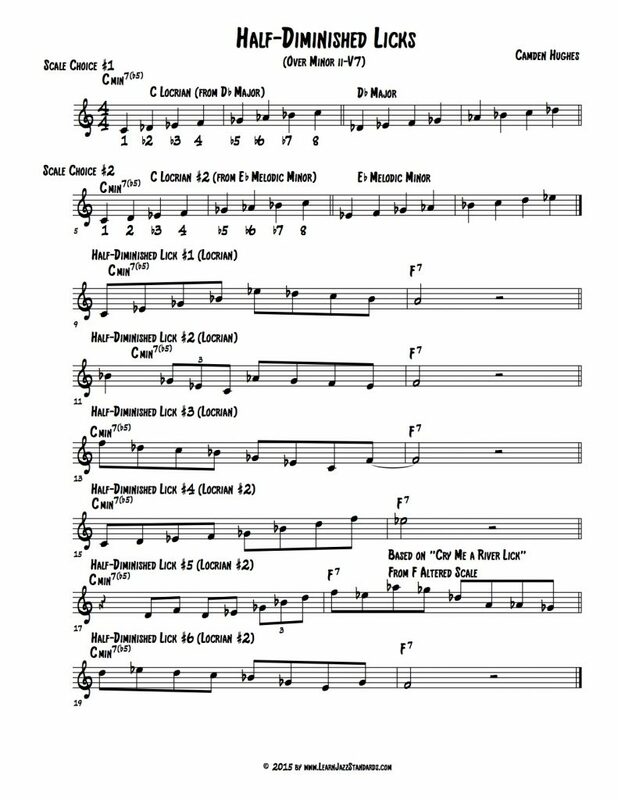 These and other scales are discussed in further detail in my other post about Jazz Scales. Are you a guitar player? Then check out our other article on Half-Diminished chords for Guitar.